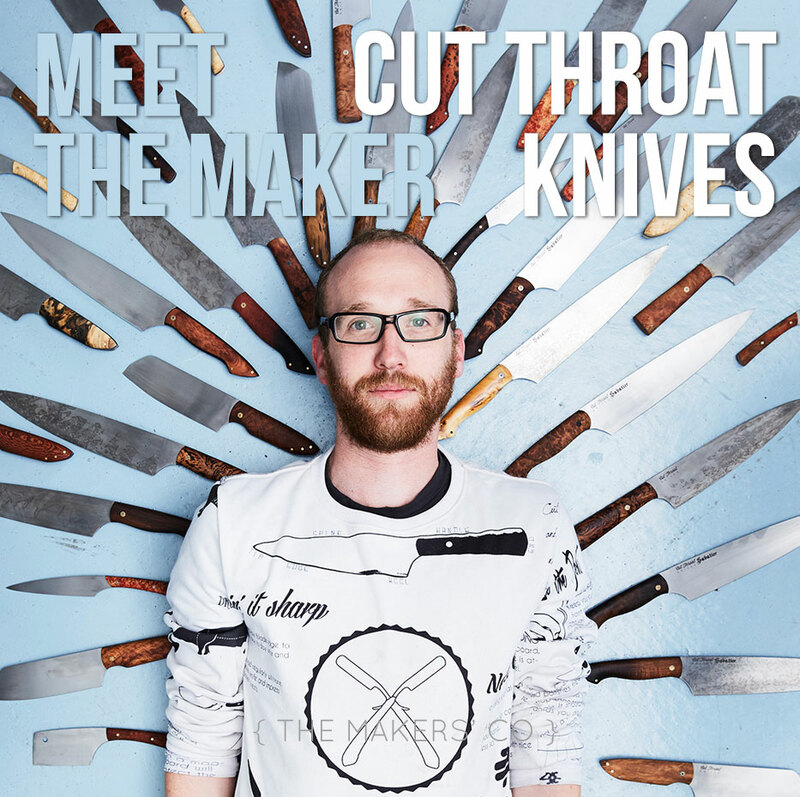 Meet the Maker this week is Aidan Mackinnon of Cut Throat Knives. 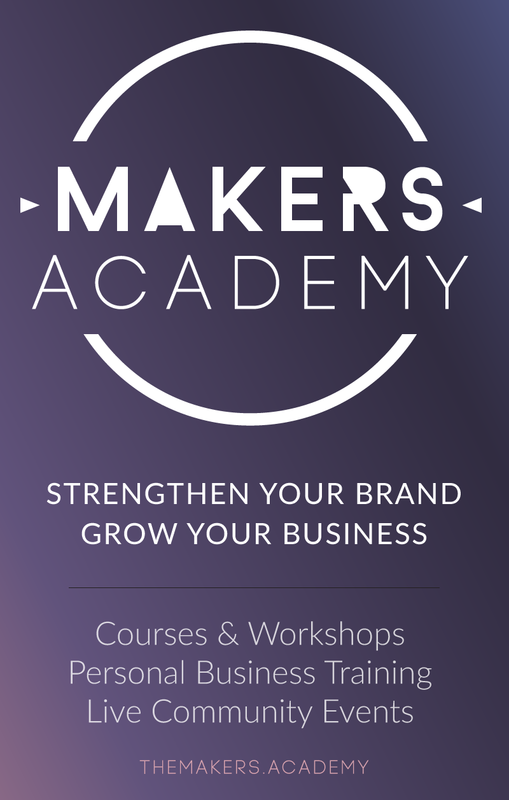 Aidan was one of the first dudes to join the Makers Community group and I’ve been following his work keenly ever since – he’s super talented and very business-savvy. My name is Aidan Mackinnon and I’m the founder and head bladesmith of Cut Throat Knives. 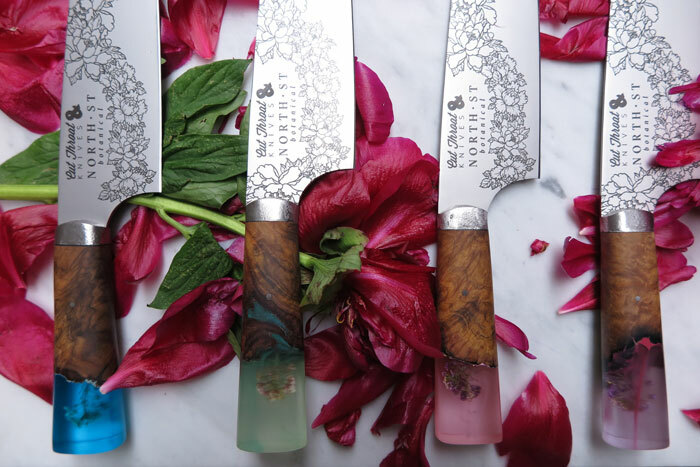 Knives are often our primary interaction between ourselves and our food – It is with this in mind that Cut Throat Knives are designed to enhance the cooking experience. All Cut Throat Knives are handcrafted in our forge. 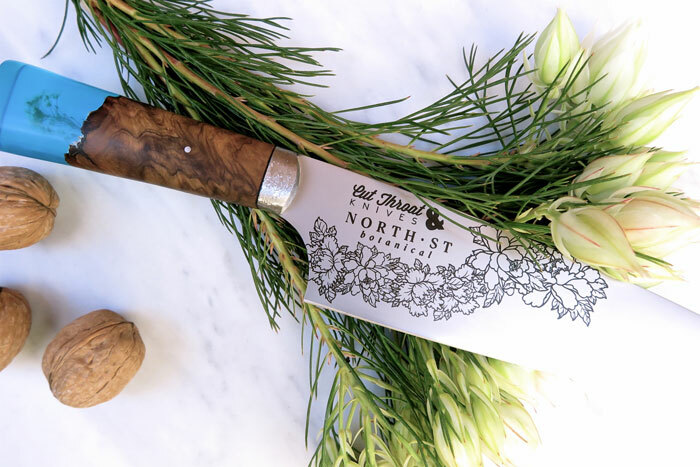 Starting with a hunk of steel and a slab of wood our bladesmiths work to create beautiful knives that perform at the very highest level for a lifetime of service and enjoyment. 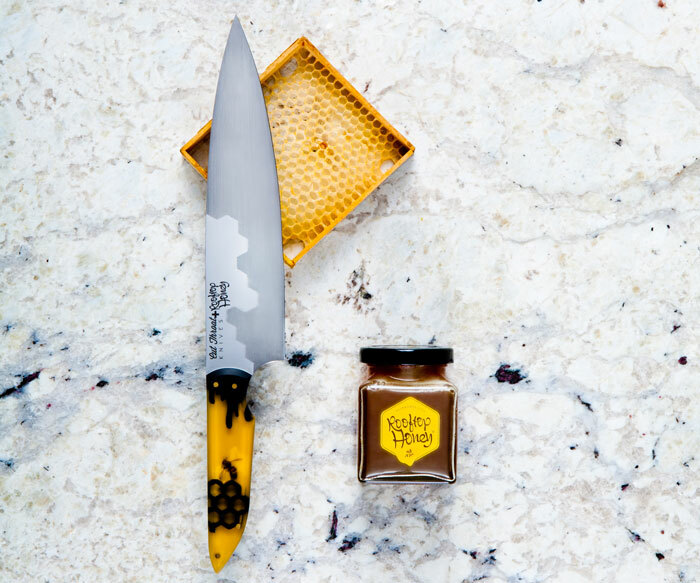 I’ve always known that I wanted to pursue something creative at one point, and food has always been a huge passion so being able to marry up my enjoyment of food, cooking and creative design worked really well. Looking back at my career before setting up my own business I realise I would have struggled in an office environment, especially where bums on seats between 9-5 matters. Working for myself, setting my own schedule and making things with my hands is just exactly what makes me happy. There is something really special and empowering about finishing a day and being able to look at physical objects that you have created. I really enjoy that I get to set my own agenda, that I don’t feel I have to sit at a desk because that is what is expected of me. I wake up in the morning and am excited to go to work every day because I love what I do. I love to push myself, to be hungry about learning and to perfect an idea over time. Right now I’m in the early stages of employing staff and it is incredibly rewarding. I get to set up the kind of company that I would like to work for. Creating a supportive and progressive working culture is its own job and I’m loving the challenge of establishing this next stage. 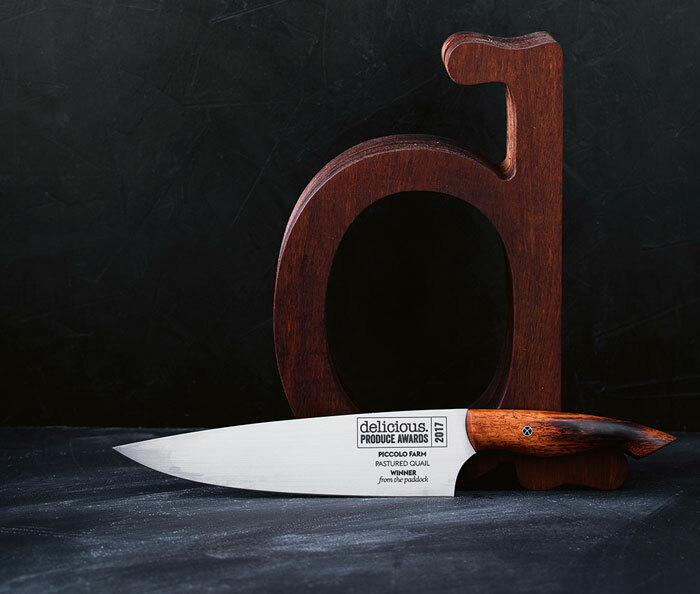 I think people respond to well made tools, and there is no greater tool in the kitchen than the chef’s knife. 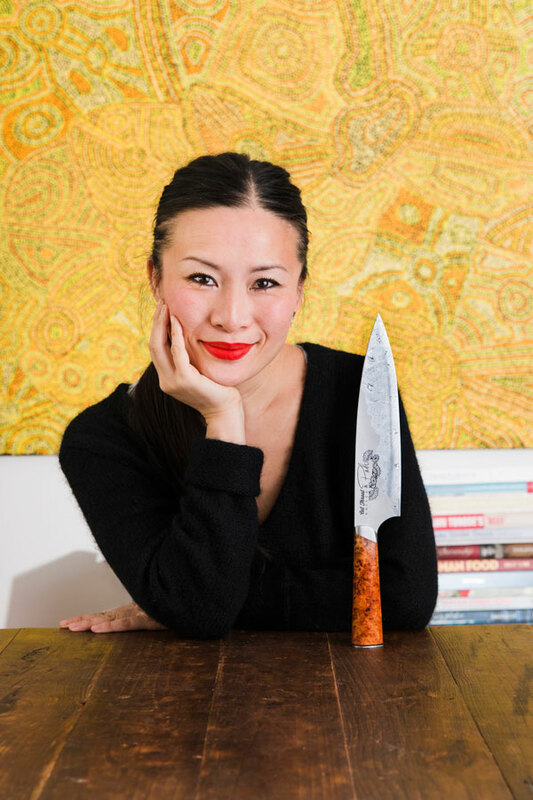 The knife is the oldest tool in a chef’s armoury – older even than the management of fire, by somewhere between a million and two million years. Even at the earliest stages of human tool making, man was not randomly slashing at his food, but making careful decisions about which cuts to make with which tools. In a world of increasingly disposable, valueless items, where homes and garage sales and superstores are packed with mediocre pieces that are bought, used, and ignored, what could be more important than learning once again to value what we buy, and feel a connection to the people who create around us? I’ve always made objects that I would want to have, that I would be willing to spend money on. My target market has essentially been me. That’s not to say that I create things purely because they sell well. It’s more that I want to make something so that it exists in the world. Over time that “ideal customer” has broadened, and I’m still learning about who exactly are the people who are purchasing my knives and how to get in front of them. I launched the business as a full time gig from day one. I knew that I wanted to pursue this and jumped in head first. I think having the motivation of knowing that failure was not an option pushed me. I have a huge list of sources that I am constantly tapping in to, and checking in on. I’m always seeking inspiration on design websites like notcot, design files and magazines like the monocle. Beyond that because I’m building a workshop and forge I’m constantly looking at workshop solutions on a variety of websites but most recently on Adam Savage’s (yes from MythBusters) Youtube series ‘Tested’. Finally I’ve got my list of businesses that I look at an try to emulate. They are a wild and diverse bunch. So Icon4x4 (custom Jeeps and Ford Broncos), Sneaker Freaker Magazine, Aesop, Wilson Brothers Design and then there are the artists like Meggs, Adnate, Audrey Kawasaki and Fafi. I think every small business owner should find some other small business owners to chat to. Owning a business can be very lonely. I compare it to the loneliness of the long distance runner. You can feel like you’re in this all by yourself and people very rarely understand just how much work goes into it. I’m very fortunate that I’m surrounded by other small business in a creative maker space. I have other business who are further along than me and I get to chat to them and get advice, but there are new businesses that are around that I get to give advice to. Teaching other people from your mistakes and successes really cements them in your brain. That in the beginning 70% of your time should be spent marketing. You can make the most incredible product in the world but if people can’t find you or can’t buy your products easily they will go elsewhere… or go to the person who is making the same product but marketing themselves well. You don’t have to spend a lot of money. Our marketing budget is nearly non existent but we spend a lot of time working to get our products in front of peoples faces. I’ve just stepped into hiring and employing people and I’m really excited to see where that goes. I’m excited to see where there creativity takes them within the company that I’m trying to set up. We are moving out of our shared workshop in the next year and moving into our own space, this will be like nothing before it. With a forge, design lab, concept store and a kitchen for classes all rolled into one… well that is the plan at least.